Surfside 606! Free Beach Service! Booking Spring/Summer 2019 Now! Surfside is walking distance to beach front restaurants, scooter and beach bike rentals, shopping and the grocery store. This unit features complimentary beach Set up during season (2 chairs and 1 umbrella), a 35 balcony that is accessible from every room for fabulous gulf views, 50 steps to the beach with private pool walk-over sky bridge, a heated pool with gulf-front sunning deck, two over-sized hot tubs, pool-side Tiki Bar open early and late in season, an exercise facility with TV s throughout, tennis and basketball courts, covered parking, interior hallways, on-site security and free WiFi access. There is even a place here to get a massage and a restaurant on site. The rental was clean, beautiful and very comfortable. We very much enjoyed our stay. The beach view was great as well. Beautiful place, had evertyhing we needed. Access to beach is hard to beat! We loved the heated pool and the quietness of Surfside. My parents have been renting from Surfside for 10 years (snowbirds) and love it! View from this room is very nice, able to see beach/ocean. Awesome balacony and lots of beachtoys for kids available (sand toys, boogie boards, etc stores on balcony). Thanks for the great review, and I hope we will see you back for the next 10 years. Great place to stay. Within walking distance from a couple restaurants we ate at. The beach and white sand was awesome. The boys had fun playing on the beach and in the water. We would definitely stay here again. Surfside 606 is a beautiful condo. The view from the balcaney is amazing. The condo had everything my family and I needed to have a great vacation. I would definitely stay there again. 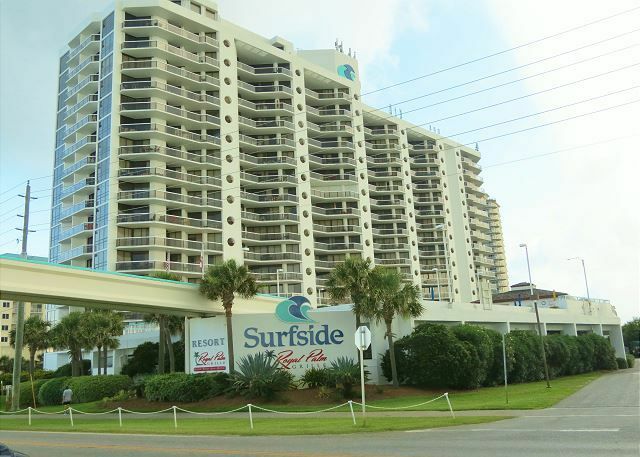 We stayed in a different unit at SurfSide in 2015 and had a great experience. I made sure we rented from the same owner this time to ensure the best experience but was a bit disappointed. The condo appeared to be clean with the exception of a very sandy floor, so we started out cleaning. The light fixture in the kitchen were hanging out by the wiring and the ceiling fixture in the master fell out onto the bed in the middle of the night. The sliding door handle was broken, there were small roaches in the kitchen cabinets and drawers, yes alive. We washed dishes before and after every meal. Finally, the water temp was inconsistent, would not stay warm for more than a minute as well as extremely low pressure. Would not recommend for the price. I apologize that your stay was disappointing. I know you contacted us about the maintenance issues, and you said it was okay to repair them once you checked out. We only have limited time between guests checking in to fix maintenance items during the busy season. We have since fixed all the maintenance items. We were also fighting a roach issue and getting pest control out to try and spot spray during the busy season as they couldn't use the serious chemicals with guests in the unit. I hope you will still give us another shot to earn your business. 606 was wonderful! This unit is very family oriented. The decor is so comfortable, everything you could need! The view from the balcony was awesome! The unit was close to the elevator which was nice but not close enough it bothered you. There was tons of beach toys to use which we really enjiyed😎 lots of plastic dishwater for small children. We even had Netflix for the rare time we were in the room. We did have a problem with the refrigerator which was quickly handled and the owner even gave us early checkin since no one had used the night before! I highly recommend this unit to especially to families with small children. We had 2 units rented and the other was very nice but not as child friendly. The remodeled bathrooms are very nice. Surfside is a great place to visit, once we discovered Destin and Surfside our family has made this our beach destination whenever we can. The owners are super nice and easy to contact. The bedroom layout was great A master suite and another room with 2 double beds and a full bath. The beach here is just beautiful and having beach chair service really made it easy. Thanks for the review. We have three great properties in Surfside to choose from. We will hope to see you again next year.